Tropical Storm Harvey is gaining power in the Gulf of Mexico, threatening to turn into a hurricane as it nears the Texas coast. 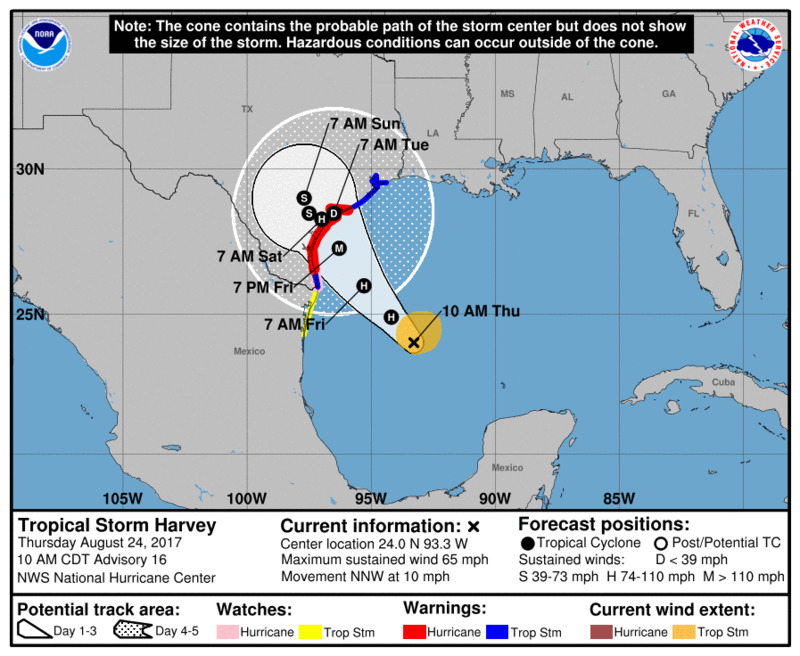 The National Hurricane Center expects Harvey to hit the southern flank of Texas as a "major hurricane" on Friday night, with wind speeds topping 65 mph (105 km/h). Once the storm makes landfall, forecasters predict it will stall until Tuesday, dumping up to 30 inches (76 centimetres) of rain onto most of Texas in a matter of days. The storm surge (the quick rise in water caused by a hurricane's strong winds) could crest 10 feet (3 metres) on Padre Island, putting many sections underwater. Many coastal towns could experience two to seven feet of storm surge. On Thursday morning, the storm was sitting about 365 miles (587 km) southeast of Corpus Christi, Texas with maximum sustained wind speeds of 65 mph (105 km/h). It's still technically a tropical storm, since the wind speed is under 74 mph (120 km/h), but is expected to become a hurricane once it makes landfall late Friday night or Saturday morning. Hal Needham, a hurricane scientist at Louisiana State University, wrote in a blog on WXshift that worrying about the storm's category underestimates how dangerous the rainfall could be and how bad the damage could get. "Hurricanes and tropical storms throw three hazards at us: wind, rainfall, and storm surge. Think of the impacts separately. Storms with weaker winds are more likely to stall and dump heavier rainfall." "This shocks people, as it would seem intuitive that a Category 5 hurricane would tend to dump more rain than a Category 1 hurricane. But the opposite is true," he wrote. While strong winds can rip shingles off roofs and tear down power lines, flooding often causes more widespread, costlier damage - and can be more dangerous for humans. Needham explained that the scale used to distinguish a hurricane from a tropical storm is based solely on maximum sustained wind, but "storms are too complex to define by one number." If you're in Harvey's path, the National Weather Service has a useful guide on how to prepare for hurricanes.